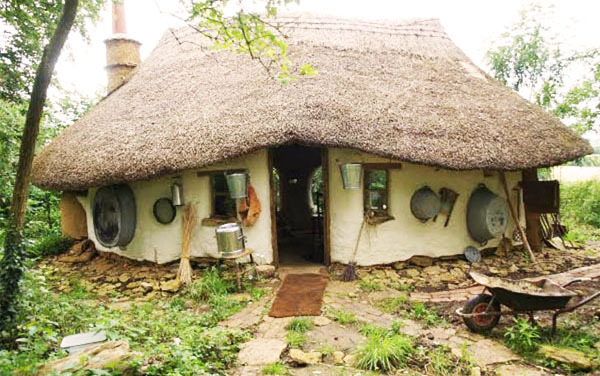 Cob is a very old method of building with earth and straw or other fibers. It is quite similar to adobe in that the basic mix of clay and sand is the same, but it usually has a higher percentage of long straw fibers mixed in. Instead of creating uniform blocks to build with, cob is normally applied by hand in large gobs (or cobs) which can be tossed from one person to another during the building process. The traditional way of mixing the clay/sand/straw is with the bare feet; for this reason, it is fairly labor intensive. Some of the process can be mechanized by using a backhoe to do the mixing, but that diminishes the organic nature of it. Because of all the straw, cob can be slightly more insulating than adobe, but it still would not make a very comfortable house in a climate of extreme temperatures. The wonderful thing about cob construction is that it can be a wildly freeform, sculptural affair. I've seen some very charming homes made this way. 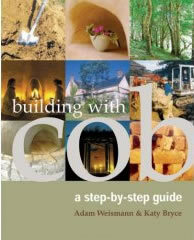 Cob was a common building material in England in the nineteenth century, and many of those buildings are still standing. A variant of cob is what is commonly called "light straw/clay". This is made with the same long fibers of straw which is tossed like spagetti with a sauce of clay slip. The idea is to coat the straw fibers with enough of the clay to get them to stick together, but not so much that it makes a gummy clump. This material is then tamped into a form and left to set up enough to remove the form. Light straw walls could be useful for interior partitions and even exterior walls if it is thick enough. 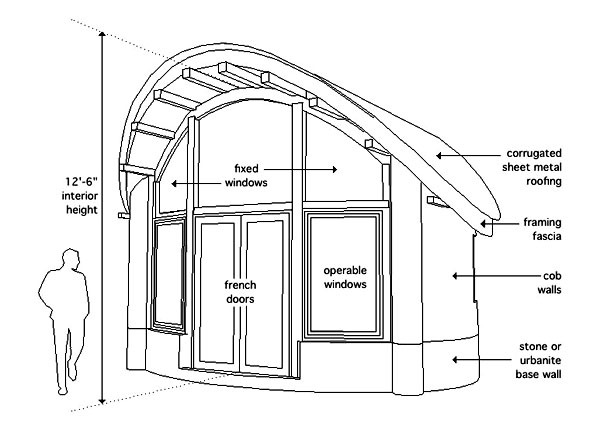 Such walls would be quite a bit more insulating than cob, but they require a timber frame of some sort because the straw itself would not be load bearing. cobcottage site for The Cob Cottage Company features information and resources about building with cob. earthedworld.co.uk a fine, informative site about cob, listing workshops, forums, and an extensive photo gallery. clay-works.com informative site with lots of pictures of various cob projects in Cornwall, England. 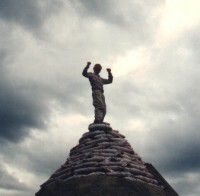 edwardsecobuilding.com features information about cobbing, with photos, articles, courses, links, etc. in the UK. 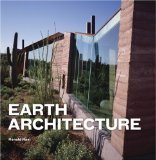 strawclaywood.com is Michael G. Smith's very informative and inspirational site devoted to various natural building methods, including cob. 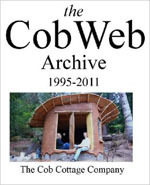 cobworkshops.org lists many workshops featuring cob in North America. naturalhomes.org lists workshops from around the world, some of them related to cob. cobworks.com information, photos, workshops related to cob. housealive.orgThis site is mostly focused on cob, and offers information and workshops that "empowers people to build affordable homes that are responsible and beautiful through the use of natural design and building techniques." mudgirls.ca A women's cobbing cooperative in Canada that offers workshops, etc. buildsimple.org Building with Hyper-Wattle is a PDF showing how to build structures using straw, mesh bags, and clay. coblist email discussion group about cob. cobprojects.info join a cob forum or browse lots of pictures and sites devoted to cob projects. daycreek.com page of photos and description of cob. clay-works.com gallery of various cob projects in Cornwall, England. ilovecob.com This blog-style site has assembled lots of images of natural building projects, commentary about them, links to related sites, and even video via YouTube that tours a lovely cob creation. cobtogether.com some nice pictures of cobworks. earthenhand.com has a nice gallery of various cob work by Scott Howard. designboom.com describes some beautiful cob domed buildings from the Masgum in the Camaroon. 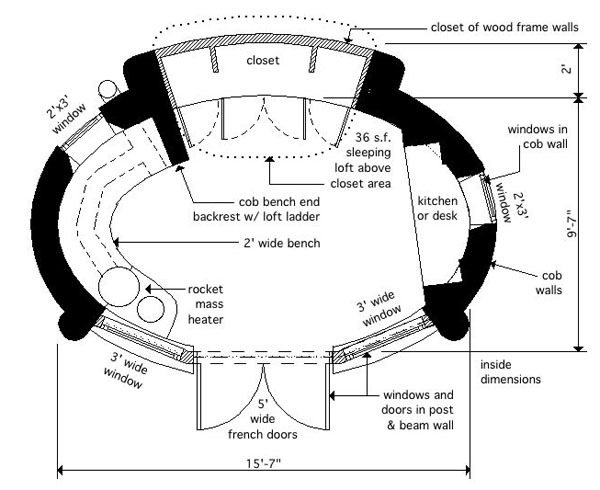 cobbuildingwithmaya.com is a well illustrated blog about building a bale/cob house. 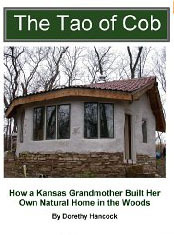 small-scale.net/yearofmud is a very nice blog about buiilding a cob house at Dancing Rabbit ecovillage in Missouri. buildsimple.org describes with video and illustrated text how Patti Stouter builds with "hyper wattle," a combination of mesh tubes stuffed with light straw clay to form light-weight, insulated, inexpensive walls.